Back in June, Dwell on Design held a week long event in Los Angeles. I attended MANY home tours and the fabulous show. I still have a couple of houses up my sleeve I have been meaning to show. 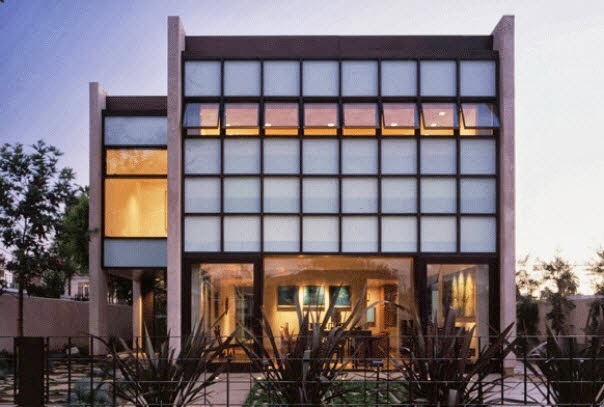 The Diane Wong Residence and Studio in Santa Monica was so unassuming from the front (as many homes are). Interesting sculpture in the front garden. Requisite Asian feng shui burbling water near the front door. And a tree still in it nursery pot. Square wrought iron gate. Kinda cool. But no landscaping on the other side. The front entrance caught me off guard. Dwell Home Tours are FAMOUS for exquisitely staged houses. I could tell by the stuff around the front doorway that this was not the case. I ambled on through a pretty ordinary front living room that was casually turned out as well. And peeked into a tidy, if somewhat plain galley kitchen. An interlocking squishy mat was on the floor to make chopping more comfortable. Honestly, I was mystified. Why was this home on the tour? OH. I glanced back down at my brochure. Diana Wong. Artist. Most of the property consists of this massive artist's studio with two small residences. Diana Wong is a renown mixed media abstract impressionistic painter. I'll say. Ya gotta love Southern California home tours. You honestly just never know what you will find. In this excellent bio by LA Artcore Webzine, they state that Diana, in China, decided she wanted to be educated in Italy, and secretly learned Italian and moved to a convent at a young age. She found her way to the U.S. in the 70s seeking medical treatment for her husband. I am looking down from a catwalk above the space. That, my friends, is a baby grand. This is one huge studio. And, the artist herself was in residence. Pretty adorable use of color in gray hair. I wonder if this is the artist's daughter? Diana is a great student of the I Ching. Who we are, from where we have come and to where we will go are the concerns of my art. I would accept that I am only a mortal who is attempting to find the key to the gate of Eternity, where art and mystery both dwell. Which explains her garden art -- a significant symbol in I Ching. 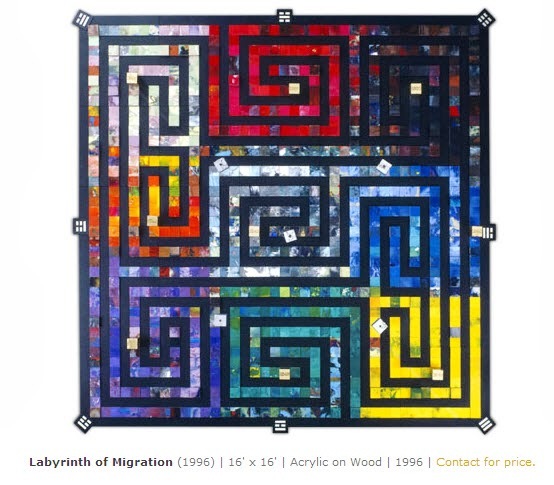 The labyrinth concept was initially inspired by a diagram in an I-Ching work that describes an ability to view the pathways (and chaos) of life when one places themselves in the center of things. She worked with multiple mediums to explore it, from dance and installation to paintings and film. In the performances, she created a labyrinth laid on the floor to move through, made from cube shaped pieces that she painted and assembled. The studio was constructed in 2003 by Paul Murdoch. Livable square footage: 5,500 square feet including studio and garage. There are two residential units, one with two bedrooms for the owner and the other for her daughter with one bedroom. But frankly, the living space wasn't the most interesting part. I'll take both of these. Thank you very much. It is an AWESOME motto. Absolutely unbelievable studio...but promise me if I ever leave a plant in a nursery pot if Dwell is involved in any way, you'll just shoot me. I will not shoot you. I will, however, jump on a plane, fly to DFW, and personally remove it. Beautiful space in which to create, and, I suspect, the artist does her living there and the rest of the house is merely utilitarian.